Always smiling and always mellow, this lovable sloth is perfect for anyone who delights in the unconventional, the whimsical, and the amusing! 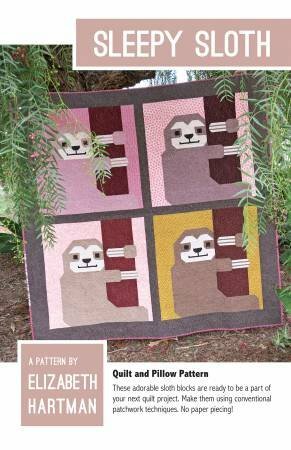 Use conventional patchwork techniques to make these charming large-scale sloth blocks for your next project. The pattern includes instructions for making large and small quilts, as well as a 24" x 24" pillow. All blocks are sewn with simple straight and diagonal seams. No templates or paper piecing! Great for using fat quarters collections as well as fat eighths, too! Two Quilt Sizes: 58" x 58" and 84" x 84"